ABSOLUTELY BEAUTIFUL GLASS TREE TOPPER! THE BOTTOM IS ROUND HAS 2 INDENT REFLECTORS AND THE MIDDLE HAS ONE REFLECTOR. THIS IS ONE OF THE LARGER TREE TOPPERS WE’VE HAD IN INVENTORY – IT MEASURES 18 INCHES! GORGEOUS COLOR AND STILL HAS THE “MADE IN ITALY” STICKER ON IT. TOPPER IS IN WONDERFUL CONDITION WITH VERY MINOR USE/STORAGE EVIDENCE – NOTHING DETRIMENTAL. THE SILVERING SHOWS WEAR/FADING AT THE BOTTOM PORTION THAT FITS ONTO TREE – THIS IS VERY COMMON AND IS NOT DETRACTING. THIS TREE TOPPER IS AN EXCELLENT ADDITION TO A COLLECTION AND IS HEIRLOOM QUALITY! REALLY NEAT ANGEL TREE TOPPER PRODUCED BY NOMA! TOPPER IS IN WONDERFUL CONDITION WITH SOME MINOR HAIR LOSS. ANGEL IS IN THE ORIGINAL BOX – BOX HAS STORAGE/USE EVIDENCE (PART OF TOP FLAP IS MISSING AND HAS SOME SMALL TEARS, ETC). GREAT RETRO ITEM! 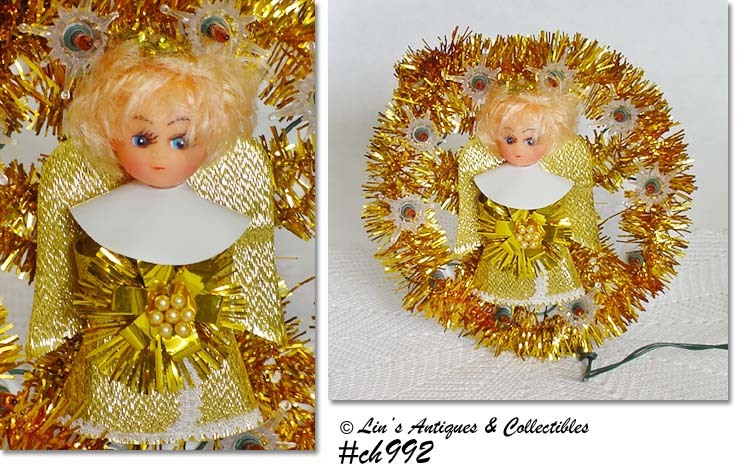 THIS LISTING HAS A SUPER TREE TOPPER – IT’S THE DIFFICULT TO FIND “HEAVENLY REFLECTING LIGHT” TREE TOPPER! MADE BY BRADFORD, TREE TOPPER IS IN VERY GOOD CONDITION AND HAS THE LITTLE PLASTIC FAN THAT IS SO OFTEN LOST. TOPPER IS IN THE ORIGINAL BOX THAT IS IN GOOD CONDITION – HAS SOME STORAGE WEAR AND A CORNER HAS BEEN TAPED. DON’T MISS THIS ONE! THESE ANGEL TREE TOPPERS ARE SO NEAT! THEY MEASURE 9 ½” TALL, HAVE GOLD COLOR ALUMINUM WINGS, CHENILLE STEM “ARMS, THEIR ROBES ARE CLEAR PLASTIC WITH GOLD COLOR MESH OVERLAY. HEADS ARE WOODEN WITH SEQUIN EYES AND MOUTH. ONE HAS ORIGINAL PRICE OF 87 CENTS WRITTEN ON THE BACK OF HER WINGS. THESE ARE UNUSUAL TREE TOPPERS! THIS TREE TOPPER/LIGHT IS PRETTY AND IT’S UNUSUAL! 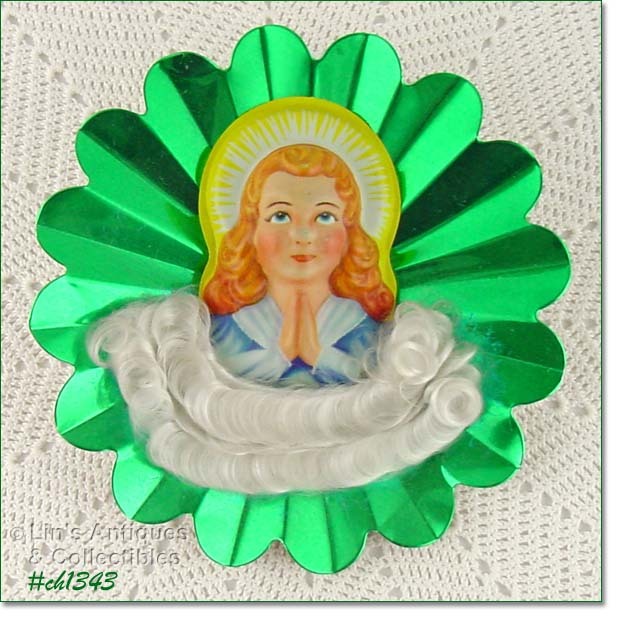 SHE HAS HER HANDS CLASPED IN PRAYER AND HER EYES LOOK UPWARD, THERE ARE ROWS OF ANGEL HAIR “CLOUDS”, AND A GREEN ALUMINUM BACKGROUND. THERE IS AN OPENING IN BACK TO INSERT THE LAST BULB FROM A STRING OF LIGHTS. THE LIGHT AND THE ALUMINUM HOLD THE TOPPER “RESTING” ON THE TREE – IT IS NOT MADE TO INSERT ONTO THE TOP TREE LIMB. THIS IS A LOVELY ITEM! AREN’T THESE PRETTY! THIS LISTING HAS A HARD PLASTIC STAR SHAPED TREE TOPPER. YOU INSERT THE LAST BULB FROM A STRING OF LIGHTS INTO THE CENTER. THE STAR IS TEXTURED FOR A PRISM TYPE EFFECT – REFLECTS LIGHT BEAUTIFULLY! MEASURE 9” WIDE (AT CENTER). I HAVE TWO OF THESE LOVELY TOPPERS, PRICED EACH. THIS IS A BEAUTIFUL GLASS TREE TOPPER – PLEASE SEE PHOTO! MEASURES 11 ¾” TALL AND IS IN SUPER CONDITION. GORGEOUS! THIS IS A BEAUTIFUL GLASS INDENT (REFLECTOR) TREE TOPPER! IT’S THE DOUBLE BALL WITH TRIPLE INDENTS (OR REFLECTORS) AND MEASURES 12 ¼” TALL. TOPPER IS IN WONDERFUL CONDITION WITH VERY, VERY MINOR PAINT/COLOR LOSS. MADE OF DELICATE GLASS AND IN THE ORIGINAL BOX BOTTOM (BOX LID IS MISSING) WITH ORIGINAL PRICE OF 89 CENTS WRITTEN ON THE BOW – WOW! 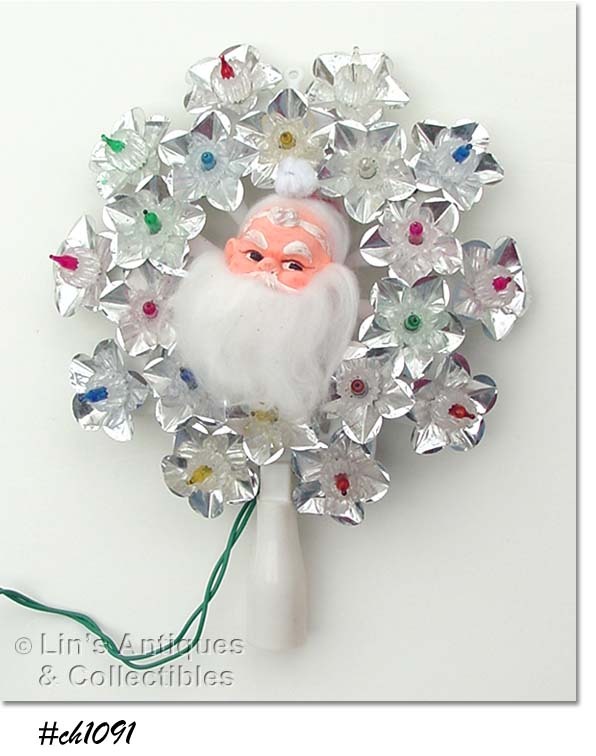 THIS IS A LOVELY AND SOMEWHAT UNUSUAL TREE TOPPER BY JEWELBRITE! IT’S VERY LIGHT REFLECTIVE AND THE CENTER HAS A LITTLE ANGEL. TOPPER MEASURES 10” TALL AND IS STILL IN THE ORIGINAL BOX. SUPER COLLECTIBLE! THIS IS A PRETTY ANGEL TREE TOPPER! MADE BY DOUBL-GLO, SHE MEASURES 7” TALL AND HAS A “CLOUD” OF WHITE COTTON AT BASE. THERE IS A SMALL HOLE AT BACK IN HER WINGS AND ALTHOUGH A SMALL BULB WILL FIT, IT IS NOT SUPPOSED TO BE LIGHTED BECAUSE THE BULB WILL MELT THE INTERIOR PORTION THAT ATTACHES THE WINGS TO THE BODY. IF YOU WANT TO ILLUMINATE THE ANGEL, I BELIEVE YOU COULD STRING YOUR TREE SO THE END LIGHT OF A STRAND OF MINI BULBS COULD BE PLACED AROUND THE TOP LIMB OF YOUR TREE AND THEN JUST SET THE ANGEL ON TOP – JUST BE CERTAIN THE BULBS DON’T REST AGAINST THE ANGEL AND CAUSE DAMAGE. THIS IS A VERY NICE ITEM AND IT STILL HAS THE ORIGINAL BOX! THIS IS A CUTIE! 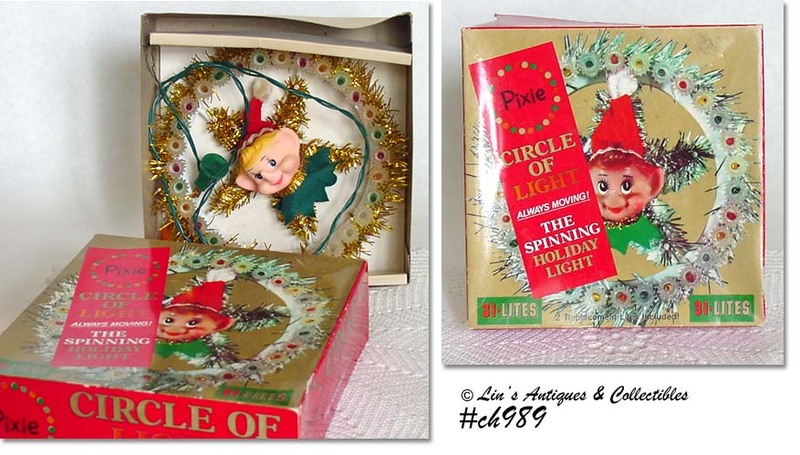 LIKE THE “PIXIE” LIGHT WE JUST LISTED, THIS ONE CAN BE USED AS A WALL OR DOOR DECORATION OR ATTACHED TO A TREE AS A TOPPER. ANGEL’S ROBE IS GOLD COLOR, TINSEL AROUND LIGHT IS GOLD, AND BULBS ARE GOLD COLOR. WORKS GREAT – 3 OF THE CLEAR PLASTIC “REFLECTORS” ARE MISSING – THAT’S IT! THIS IS A REALLY CUTE HOLIDAY ITEM! PER BOX, IT’S A “CIRCLE OF LIGHT, THE SPINNING HOLIDAY LIGHT”. CENTER HAS A CUTE PIXIE (ELF) AND THERE ARE 31 BULBS IN THE “CIRCLE”. 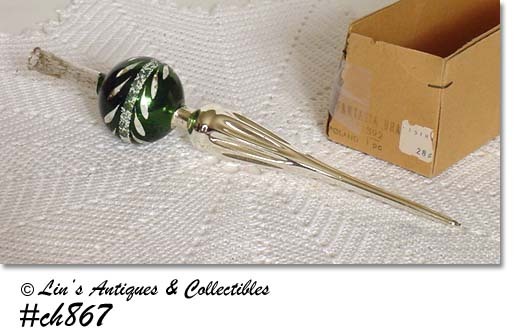 PRIOR OWNER DISPLAYED IT IN A WINDOW OR DOOR – A SMALL WIRE IS ATTACHED AND A SUCTION TYPE HANGER IS IN THE BOX. I THINK THIS COULD ALSO BE USED AS A TREE TOPPER BY PUTTING A PIPE CLEANER/CHENILLE STEM OR WIRE BEHIND THE ELF AND ATTACHING IT TO THE TREE. NEAT ITEM! THIS IS AN UNUSUAL TREE TOPPER! MADE BY BRADFORD, THE TOPPER IS A LIGHT GREEN COLOR HARD PLASTIC STAR WITH AN ATTACHED ANGEL (BUST). THE TOPPER IS ELECTRIC AND WORKS GREAT – VERY PRETTY! DIFFICULT TO FIND BRADFORD ITEM. ABSOLUTELY BEAUTIFUL TREE TOPPER WITH DOUBLE REFLECTORS! TOPPER WILL COMPLIMENT ANY ORNAMENT/DECORATING COLORS. MEASURES 12 ½” TALL AND IT HAS A SLIGHTLY SMALLER OPENING BUT SHOULD WORK NICELY ON A TALLER TREE. TOPPER IS IN WONDERFUL CONDITION WITH MINOR COLOR LOSS. THIS IS A BEAUTY – TREE TOPPER IS HOT PINK AND SILVER! IT HAS 3 REFLECTOR AREAS SO ONE IS VISIBLE NO MATTER HOW YOU TURN YOUR TREE. IT’S ACCENTED WITH WHITE GLITTER TREES. MEASURES 11” TALL AND IS PERFECT FOR USE ON A 5 OR 6 FT. TREE. IN WONDERFUL CONDITION – THERE ARE A FEW DARK SPOTS ON THE SILVER THAT IS NOT UNCOMMON WITH THIS COLOR. ANOTHER BEAUTIFUL BLOWN GLASS TREE TOPPER! THIS ONE IS GOLD AND SILVER WITH SILVER COLOR GLITTER DESIGN. MEASURES 10 ¾” TALL AND HAS THE WIDER OPENING FOR USE ON A TALLER TREE. VERY NICE! BEAUTIFUL TREE TOPPER MADE IN POLAND OF DELICATE GLASS! TOPPER IS SILVER AND DARK GREEN WITH A PRETTY GLITTER DESIGN. MEASURES 9 ¼” TALL – PERFECT FOR A SMALLER TREE. TOPPER IS IN THE ORIGINAL FANTASIA BRAND BOX WITH ORIGINAL PRICE STICKER OF 28 CENTS – WOW! THIS IS A REALLY NEAT TREE TOPPER! MEASURES 9 ½” ACROSS, 8 ¾” TALL AND HAS AN ALUMINUM REFLECTOR IN CENTER TO REFLECT THE LIGHT COLOR OF YOUR CHOICE – YOU PLACE THE END BULB FROM A STRING OF LIGHTS THROUGH THE CENTER. TOPPER CAME IN A BOX (I’M ASSUMING IT TO BE THE ORIGINAL) WITH A 59 CENTS PRICE TAG FROM THE “THE M. O’NEIL CO.”. NEAT TREE TOPPER BY JEWELBRITE! 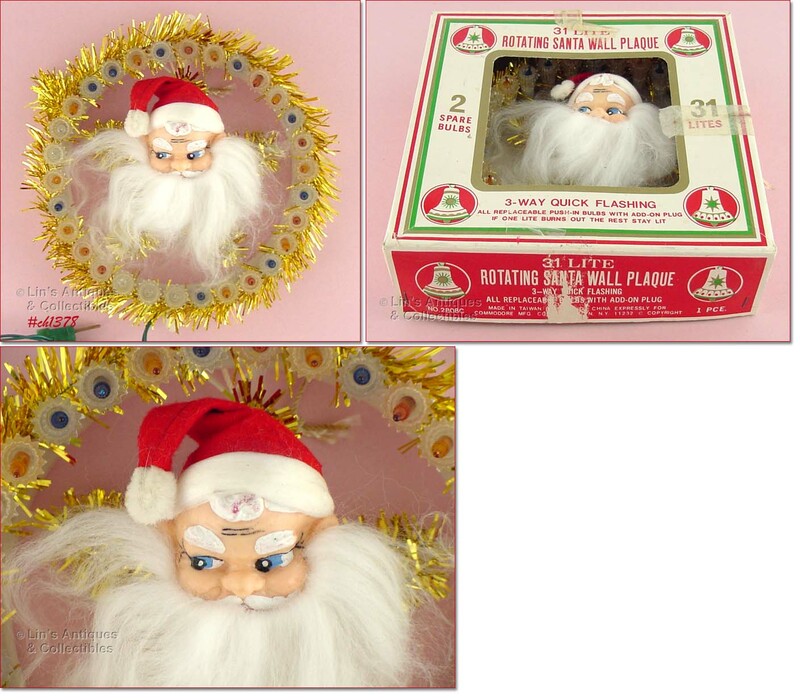 GOLD COLOR PLASTIC STAR WITH LITTLE ANGEL ATTACHED TO FRONT – STILL IN ORIGINAL BOX WITH WOOLCO PRICE STICKER OF $1.27. CUTE TOPPER, PERFECT SIZE FOR A 4 FOOT OR SMALLER TREE! FROM THE CLOSED DRY GOODS STORE, THIS IS A SUPER RETRO ITEM! STAR POINTS ARE 12” (POINT TO POINT) AND CAN BE USED AS A TOPPER OR HUNG FROM A WINDOW, ETC. MADE OF HEAVY CARDBOARD AND IS IN VERY GOOD CONDITION – A COUPLE POINTS ARE SLIGHTLY BENT FROM STORAGE – AFTER ALL, IT’S AT LEAST 30 YEARS OLD!